Home » Posts Tagged "TSW"
English please. I realize this title is completely meaningless for somebody who’s not playing “The Secret World”. 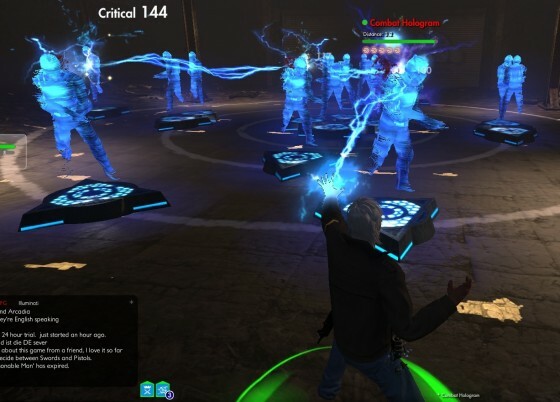 But hopefully it catches somebody’s interest who’s gotten a bit deeper into the workings of the combat abilities in TSW. For the record: this is not an exploit in the standard MMORPG sense. This is using a game mechanic in a way the developers intended. Each weapon group in TSW has its own way to build resources: Melee weapons build up with each use of a builder attack and slowly out of combat. Which means, for melee, you can open your attack with a finisher using maximum resources. Magic is building up resources only when builder attacks are being used. And finally, ranged weapons build up resources with each builder attack, but they are bound to a single target. If the target dies, the resources are lost. Magic and melee attacks are independent of the target. They remain usable after a target’s death. However, with chain attacks things become interesting. A chain attack hits a first victim and then jumps over to up to 4 more targets. Imagine a lightning bolt not only hitting you, but the 4 people right next to you. If a ranged resource is built through a chain attack, it is built up on each target hit by the chain. Which means, you can execute a finishing attack with maximum resources, switch to the next target and execute another maxed finisher. Rinse and repeat. Only pistols, elemental and blood magic have chains as part of their standard abilities, but the use of this mechanic is not restricted to these weapons. Some passive abilities can turn certain attacks into chains. As long as the resource building is done with a chain attack by one of those weapon types or triggered by a passive ability and the finishing move is using a ranged weapon, this mechanic can be used. Caveat: Right now, my pistol/elemental character delivers pretty good dps. I just don’t get around to tab target through 3 or 4 enemies and dispatch them one by one with finishers. They are down way earlier. That’s why it took a while to notice this great option. 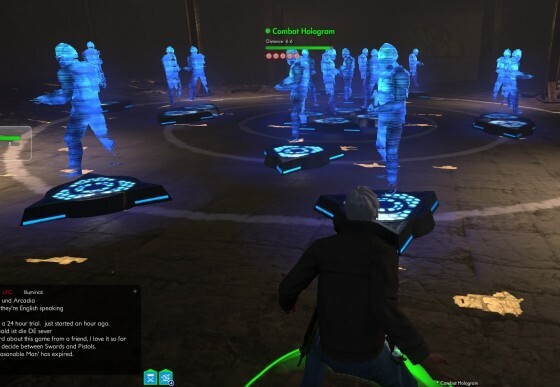 It looks to me as if in this alternate reality the Orochi Group or one of its subsidiaries has the population convinced that keypads, accepting three digit codes, are safe enough to protect the deepest mysteries of secret societies. They did convince the Illuminati in Kingsmouth. You either spend some time googling the code. Or an hour or two trying all 1000 codes. Okay, you may have to bring a gun for the zombies. I bet there will be more of those easy to unlock keypads throughout this world. Its cheaper than back doors or little holes in the frame to reset the device with a pin. I should mention that the code they protect their own facility with is 6 digits? 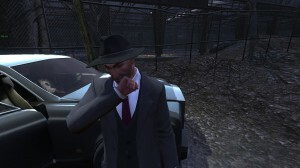 Nicholas Winter has been dealing with his father Nathaniel Winters estate, the Atlantic Island Park, a haunted amusement park on the Savage Coast, in particular. He’s let you already run two missions for him during which you learned about secret forces binding Nathaniel and now Nicholas to the place. A third party is interested in the park as well and everybody is out to control the power emanating from it. Nicholas Winter was heartless and calculating and his obsession with the park was for a reason, just like his decision to leave the park to his son. Decipher Nathaniel Winter’s Last Will and Testament and uncover what Nicholas was meant to see. The will is in the car on the seat next to the deceased driver. Nicholas Winter is the sole heir. However, the quest will not be updated by just reading the will. You need to use the monocle you got as a result from the previous quest “The Carnival of Souls”. There you will learn more about the park and the next step. Go inside the barn on Henderson’s farm and pick up a piece of the plan from the floor. Another party is looking for the plans of the park as well. That’s why they have been divided and hidden. You have to think and see like Nathaniel Winter to decipher them. Use the monocle on the plans you just found. You’ll see a park map with some white symbols imprinted on them. Follow the symbols and search thoroughly along the path. You’ll find the next part of the map on the outside of the Bumper Cars’ cage just where the white symbol runs through. A bit further along, at the Ferris Wheel, you will find a red lens in the middle of some shards. Continue your search, your deciphering attempts and stay ahead of the other party. The map you found doesn’t look special at all. But the red lens looks just like your monocle. Insert it into the monocle, using the assembly window (Y). Now look at the plans again: Red Symbols will lead you to the next piece of the plan. It’s affixed to one of the vendor stands. Not far from here, among the stands, are again shards right in front of a vending machine. This time you’ll find a blue lens. Keep going and find more pieces to the plan. Follow the hints given to you by the pieces you found so far. The map is again a standard map. Lets pop in the blue lens. But you need to remove the red lens first, using the disassemble slot. Now the plans reveal another symbol, which you can follow. At the Roller Coaster you’ll find the next piece on the eastern ramp on the fence. The park is a gigantic Anima Capacitor, designed to accumulate energy and channel it into a subject. Neither Nicholas nor the Phoenicians must be allowed to accomplish this goal. We’ve run out of lenses for the monocle. There’s only purple light around, annoying us. But red and blue makes purple. Build a monocle with a purple lens. The last piece of the plan leads us to a shed in the center of the park. 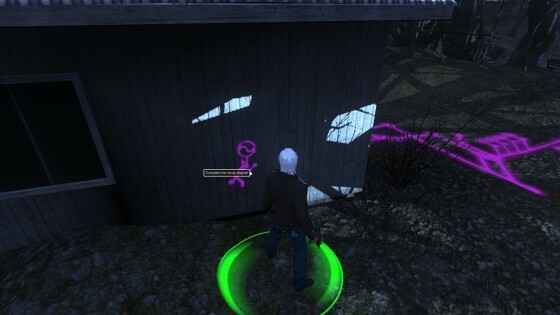 Assemble the plan by clicking on a purple symbol on one side of the shed. The full circuit is drawn upon the wall. To overload the circuit, you need to click in order on the electronic parts that make up the diagram. Start with the AC voltage source and then work your way around the drawing counter clockwise (Resistor, Diode, Inductor). A cut scene will show the Phoenicians moving in and getting killed by a purple energy storm, which brings the park finally into a more peaceful state. Since I haven’t made much progress in understanding character builds, decks and the ability wheel, I need to slow down for a while and study. And why not do that by just analyzing the deck I am using, pre-made by FunCom: “Ninja”. It’s a melee build using blades and elemental magic for some ranged abilities and to spice up things. And by spicing up I mean synergies, something, the designers of “The Secret World” have declared as basic principle behind the creation of the abilities for player characters. 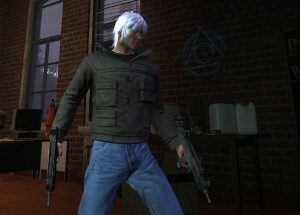 “The Secret World” organizes character abilities in a wheel, consisting of 3 sections with 3 weapon/school types each. For each weapon type, there are 2 inner and 6 outer groups of 7 abilities each. Add 3 more groups with miscellaneous abilities. This adds up to 9 * 8 + 3 = 75 groups or 75 * 7 = 575 abilities. Getting all skills of an inner group will cost you 19 ability points. All skills of an outer group will cost you 169 AP. That’s a total of 9975 AP. To say the least, this is overwhelming. There are already a good number of guides out there, but I am still far away from really understanding what’s going on. Let’s start with a quick overview of guides & tools: The most comprehensive guide is Yokai’s guide to build mechanics and build philosophy. It’s still a lot to digest. 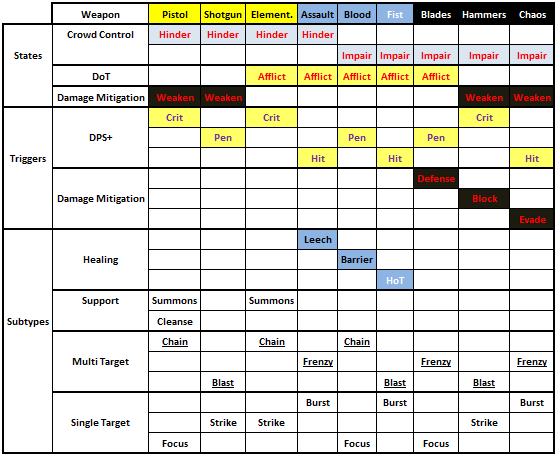 There’s Seki’s “Weapon synergy and build discussion”, which will go away once the TSW boards are reformatted. You’ll find a copy of the post here. There’s also a nice calculator at Bad Omens. Now we will take a look at the abilities being used for the deck. The damage amounts are taken from an empty build, most of them will be higher when more skill points are added. Please ignore them for now, the actual damage is secondary. Delicate Strike: Builds 1 resource for each equipped weapon. A single target attack that deals 48 physical damage. 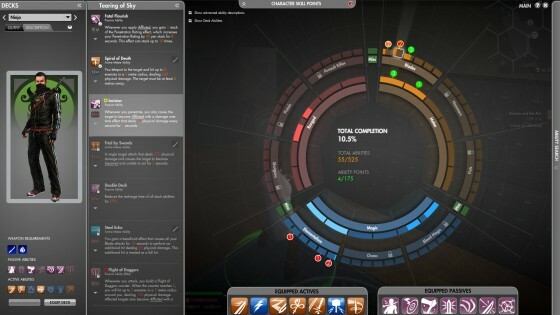 Resource Builder, buffed by “Delicate Precision” passive to increase penetration chance. Clearing the Path: Consumes all Blade Resources. A PBAoE attack that deals 57 physical damage. This attack penetrates any Afflicted targets it hits. Blaze: Consumes 3 Elemental Resources. A single target attack that deals 164magical damage, or 181 magical damage to Afflicted targets. Surging Blades: A column dash attack that deals 58 physical damage. Utility: gets you to your target fast, and if you do it right, away as well. Flashpoint: A single target attack that deals 35 magical damage. The target also becomes Afflicted with a damage over time effect that deals 20 magical damage every second for 5 seconds. If the target is already Afflicted, it will cause 5 enemies in a 5 meter radius around them to become Afflicted with a damage over time effect that deals 20 magical damage each second for 5 seconds. Single target, exploits and triggers Afflicted. Ice Manifestation: Places a manifestation at the targeted point that lasts 9 seconds. Every 3 seconds it will hit up to 5 enemies in a 5 meter radius, dealing 40 magical damage. Affected targets will also be rooted to the ground for 2 seconds. Four Seasons: A channelled attack that deals 31 physical damage each hit. The damage dealt increases by 5% for each hit, and all hits will penetrate. The last hit will cause the target to become Impaired and unable to act for 3 seconds. This ability has a 15 meter range. Single target attack, triggers Impaired and Afflicted, the later because it’s buffed by Incision. Fortunate Strike: Whenever you attack an Afflicted target, there is a 10% chance you will perform an additional hit that deals 21 physical damage. Aidelon: “Blaze” has a 100% chance to critically hit Afflicted targets. Twist the Knife: Whenever you penetrate you also gain 1 stack of a beneficial effect, which increases all damage dealt by3% for 10 seconds. 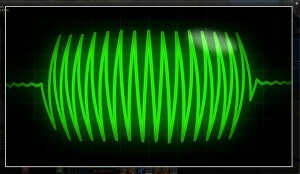 This effect can stack up to 3 times. Incision: Whenever you penetrate, you also cause the target to become Afflicted with a damage over time effect that deals 10 physical damage every second for 3 seconds. Triggered by Penetrate, triggers Afflicted. Sudden Return: Whenever you penetrate, you also perform an additional hit that deals 18 physical damage. Delicate Precision: Increases the Penetration Chance of “Delicate Strike” by 10%. Flight of Daggers: Whenever you attack, you build a Flight of Daggers counter. When the counter reaches 5, you will hit up to 3 enemies in a 5 meter radius around you, dealing 46 physical damage. Affected targets also become Afflicted with a damage over time effect that deals 10 physical damage every second for 5 seconds. The key to this build lies in the passive ability Incision and the active ability Clearing the Path. Incision causes affliction with the first penetration and Clearing the Path penetrates everything that’s afflicted. Thus, as long as you keep up with time-outs, your target will remain afflicted and penetrated a lot. This deck gains even more by abilities exploiting the constant affliction and high rate of penetration. Blaze and Flashpoint are active abilities which benefit from the target being afflicted. Fortunate Strike and Aidelon are passives which benefit as well. Additionally, Twist the Knife, Incision and Sudden Return all amplify the effects of penetrate. By analyzing a single pre-made deck, we’ve seen how well 7 active and 7 passive abilities can interact with each other. Writing this article was an exercise for myself to learn how this interaction happens and I think I know much better now what to look for in other builds. It will still be a challenge to come up with a build of my own, but the first step is done. 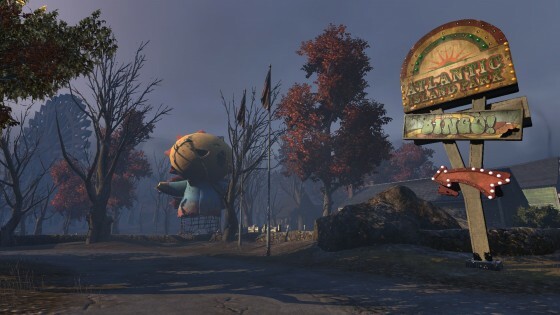 This article has been posted originally at “The Secret World” forums. It is being republished here with permission of the original author, known as “Seki” on the TSW forums. Go to the table for the primary weapon you are interested in. The column at the far left of the table will list the States, Triggers, and Subtypes associated with the primary weapon that can be in common with the States, Triggers, and Subtypes associated with the given secondary weapons listed to the right of the primary weapon. 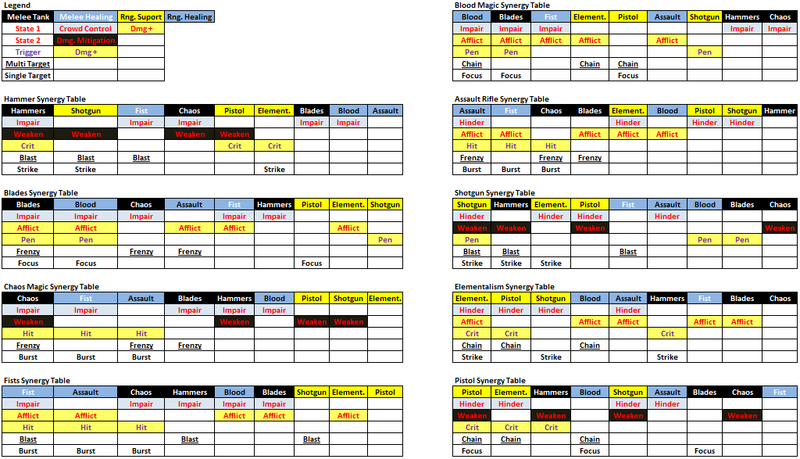 The columns in each table are arranged approximately in order of decreasing synergy with the selected primary weapon. In the Hammers Table, it shows Hammers have a lot of overlapping synergies with Shotguns (Weaken, Blast, and Strike), where as Hammers have one overlapping synergy with Blood Magic (Impair). The more synergies and kinds of synergies, the more ranges, and the more trinity types, the greater the combinations potential diversity. Below is a Master Table. I think it is less convenient to use than the tables above, but it may be more natural for others. Subtypes (The type of ability, e.g. a heal, a single target attack, basically characteristics that are always tied to the ability). Non-Glancing/Hit = white and standard font size, note that Crits can be Non-Glancing, so any Non-Glancing Crit should also qualify as a Hit. —–If Glance triggers, Hit and Crit cannot trigger (and vice versa), and Evade and Glance are mutually exclusive. —–If Block triggers, Penetrated cannot trigger (and vice versa), and Block and Evade are mutually exclusive. The system appears to treat magic and melee in the same manner, except there is a different mitigation stat for Physical and Magic attacks. Some Active abilities require a specific weapon type (ex. a Blade) to be equipped to function. Some active abilities do not require any equipment to function. Passives do not require any type of gear to be equipped to have their effect. Anima Points are used to buy Abilities. Based on a dev quote, you gain an AP every ~5-10 minutes at the start of the game and an AP every ~3 minutes or so at the end. Training a skill from level X-1 to level X costs X SP. A max build costs 5 x 55 SP = 275 SP = 825 AP. Given the estimated rate of AP gain, a player could have around 400 SP at ~ 100 hours in. It looks like a player could have ~ 2300 AP by the conclusion of the Transylvania story thread ~ 150 hours in. Every weapon has a single target and a multi-target subtype. Every weapon has access to a type of CC as a state, in general melee gets stun-like CC (shuts down your ability to take action), ranged gets roots/snares, the exception is Blood Magic which gets stun-like CC. A weapons 2nd state is either Debuffs or DoT’s. Every weapon has a trigger that increases damage. 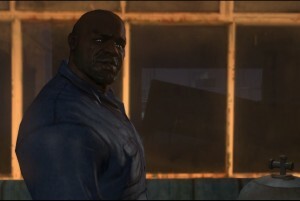 Ellis Hill is the go to guy for everything that needs fixing. He’s already sent you on a mission to fix the power supply. The next problem are radio reception issues. He claims he’s only interested in civil stations, be it the Gospel Channel or a Red Sox game, but it all seems somewhat suspicious. The airport’s radio mast is beyond repair, according to Ellis. But it really looks like he wants you to keep away from it. Go and investigate the mast. Locate and examine the radio mast: It’s not far from Ellis’ hangar on top of the airport tower. Research the mast and find the components that need repair. Source the components to repair the mast: Two hangars are in a marked area just a bit further down. You’ll find a dozen odd items which may or may not be used in antenna repair. It doesn’t say which one is used, when you click the mast, they all disappear. My money is on the wire hanger. OMG OMG Panic. It’s morse code transmitted at full speed: dah di dit, di dah dit. If you want to solve it yourself, record the transmission and slow it down with your favorite audio tool. Everybody ought to have one. Then use google to find a morse alphabet. Or look here: drop location 712 536. Which are map coordinates. There’s a water puddle between the rocks southeast of the house near the scrapyard. That’s where the drop’s going to happen. Open the huge crate that’s being dropped off. It contains a bulky monster you need to kill. Or be killed.